Talking about books, Dynamic Identities in Cultural and Public Contexts is a book by Ulrike Felsing, published by Lars Müller this year. The book explores and showcases different approaches to dynamic identities, and simultaneously introduces us to related topics and concepts in a larger context. One of it’s aims is to show and describe the general principles of variation processes. This is done through 24 case studies, everything from typographic systems like A typeface for the Twin Cities by Letterror, to visual identities for The Cinémathèque française by Ruedi Baur et Associés or Rotterdam 2001 by Armand Mevis and Linda van Deursen. Even many of the examples seems quite old today and the works could have been more varieted from more nations, (the netherlands highly represented), the book in total fulfills it’s aim and deliver an inspiring and promising introduction on the subject of dynamic identities. This publication studies methods for creating flexible looks for public and cultural institutions. The classic logos normally used by companies are the result of a unique process of compression and abstraction. By contrast, flexible looks do not conceal their diverse components of identity in a logo, forming instead a complex family of symbols from them. In the combination of a basic logo and a family of symbols, the look is in a position to represent the fundamentals (the philosophy of the institution, its program) and the specifics (e.g., temporary exhibitions and events). The author describes the effect and potential of looks and offers the criteria that distinguish fully developed, dynamic looks. Case studies of famous designers such as Karl Gerstner and Ruedi Baur enhance the analysis. Images and quote from Lars Müller Publishers where you also can buy it. Back in the 60’s, Swiss designer Karl Gerstner wrote Designing Programmes, a book about systems in graphic design that still valid nowadays and should be a reference for any graphic designer interested on this approach. 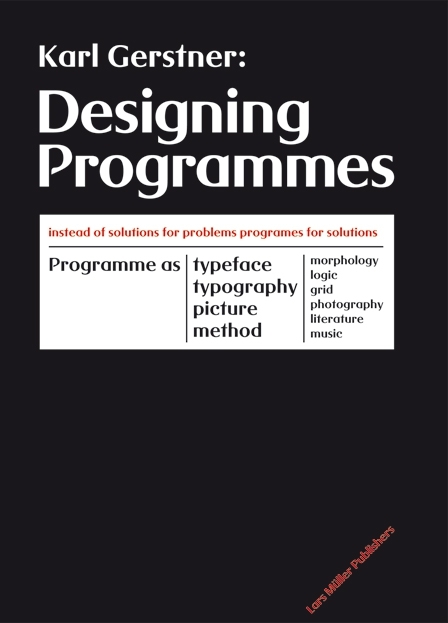 Designing Programmes is published by Lars Müller. Scroll down to see more details about the book by the middle of the page. Calligraphy and hand-drawn letters comprise series of strokes and curves; mechanical typography does too, through the engraving process of punches and counter-punches. Digital typography, however, dematerializes this operation, leaving the choice of formal references open-ended. 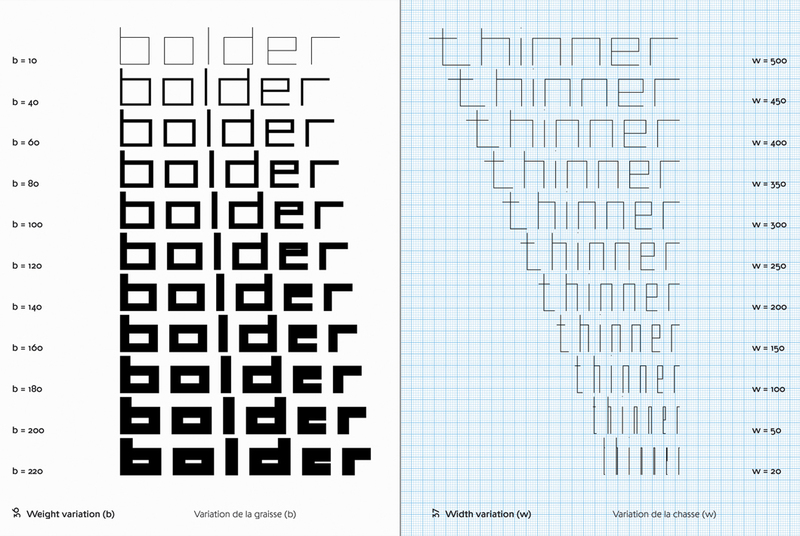 Does that mean novel forms of design could evolve through manipulating fonts’ algorithmic data? Several small scripting programs were developed and tested by the students during a series of workshops. Finally I bough it. It is gorgeously printed in black and orange and I started reading it yesterday. Just with the introduction and the first chapter I have to say that it is worth reading.